Posted May 22nd, 2012 by David Porter & filed under Technology. Ask almost anybody: who was the father of the internet? The usual response is Sir Tim Berners-Lee. Those who know some history might say that in fact Alan Turing is the real father. 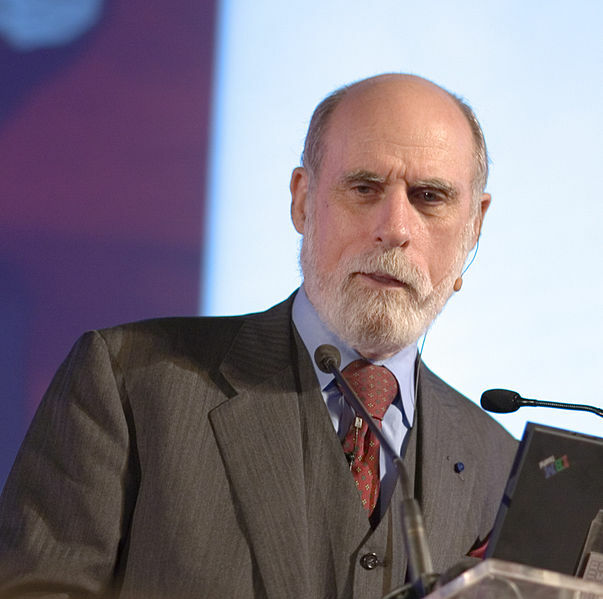 However, Ryan Singel interviewed a man called Vint Cerf for Wired magazine (April 12). Well, Cerf (with Bob Kahn) is the man who invented the protocol that rules them all, TCP/IP. It ‘describes the fundamental architecture of the internet and it made Wi-Fi, ethernet, LANs, the World Wide Web, email, FTP, 3G/4G possible, as well as all the inventions built on those inventions’. That’s amazing enough, but that he did it in 1973 is beyond belief for anybody born after then. He co-founded the Internet Society (ISOC) and was president of ICANN, operating the domain names. Cerf picked up ideas from the circuit switching employed by telephone companies and packet-switching (which had been toyed with a decade earlier) experiments to interconnect computers. He and others together came up with software for computers connecting, with the need to use computers in ‘command and control’, to organise resources, to put them on moving ships, planes and cars as well as fixed locations. From this, evolved the idea of open networking, ‘multiple networks, all packet-switched, but with different characteristics’. They pondered the problem of ‘how can you make all the computers on each of those various networks think they are part of one common network, despite all these variations and diversity’. By 1973 they’d had experience with email, called The Online System, with ‘documents that pointed to each other using hyperlinks’. Doug Englebart invented the mouse. Cerf told Singel: ‘The big deal was you could have arbitrary large number of networks so that they would all work together. And the theory we had is that if we just specify what the protocols would look like and what software you needed to write, anybody who wanted to build a piece of internet would do that and find somebody who would be willing to connect to them. Then the system would grow organically because it didn’t have any central control’. He said the network has grown organically, though the Internet Corporation for Assigned Names and Numbers (ICANN) was the closest yet come to a central control. The domain names system was not invented till 1984, just after they had gone through several robust implementations of the protocols to launch the net in January 1983. Since then new devices, new protocols, new versions of internet creativity have mushroomed as cross-fertilisation of ideas really took off. Cerf did not patent his protocol for military use, and by the late 1980s a commercial phenomenon began as universities built campus networks. The next step was to open it to public access, given that the US government had decreed that ‘you could not put commercial traffic on government-sponsored backbones’. So Cerf thought, ‘we’re never going to get commercial networking until we have the business community seeing that commercial networking is actually a business possibility’. He got permission from the US Federal Networking Council to connect MCI Mail to their internet as a test for a year. That led to other commercial providers wanting in, and because they were all compatible with the email’s protocols, ‘all these isolated email systems could now talk to each other. It was just pretty dramatic and it broke many different barriers’. Commercial ISPs started and the rest is the history most people are familiar with. Cerf said they designed the IP protocol to beat almost anything it comes up against, a ‘future-proof protocol’. The key was that the packets of the internet protocol layer ‘didn’t know how they were being carried, whether by satellite link, mobile radio link, optical fibre or something else. Software had to know how to inject it into a link, but the basic protocol never knew. He said: ‘we hear people saying, the internet will be replaced by X25 or frame relay or APM or add-and-drop multiplexers.’ He is proud that it will not be replaced, it ‘just runs on top of everything’. But he concedes that Deep Packet Inspection will have more network control and he is worried about that, unless it’s to determine a network fault. He was further concerned about network neutrality, a ‘business issue’ to do with lack of broadband access competition, and about the introduction of IPv6. This is the protocol designed to supercede version 4 (version 5 ‘never caught on’), to deal with IPv4 address, space and routing table capability exhaustion. He thought that on 6th June this year all who can will turn on IPv6 capability, with a messy end to IPv4 as people seek to monetise what’s left of it. Cerf, ‘at Google my title is Chief Internet Evangelist, states his challenge: ‘we have three billion users, and there are seven billion people in the world. Which means we have four billion people to convert. That’s a big challenge. And it’s turning out to be not so easy to get everybody to build the infrastructure that’s needed’. For him the internet is ‘organic’ so to talk of versions is misleading. The domain name system is evolving with security extension, new encryptions are arriving and he believed that weaknesses technologically can be dealt with, although new security features will be built. Enhanced user experience will become important. Last optimistic word to the man: ‘I think that it’s perfectly reasonable to have IP packets raining down from satellites being picked up by hundreds, if not millions, of receivers at the same time’. Wired UK, Ryan Singel, April 2012. The Internet Society, Brief History of the Internet.